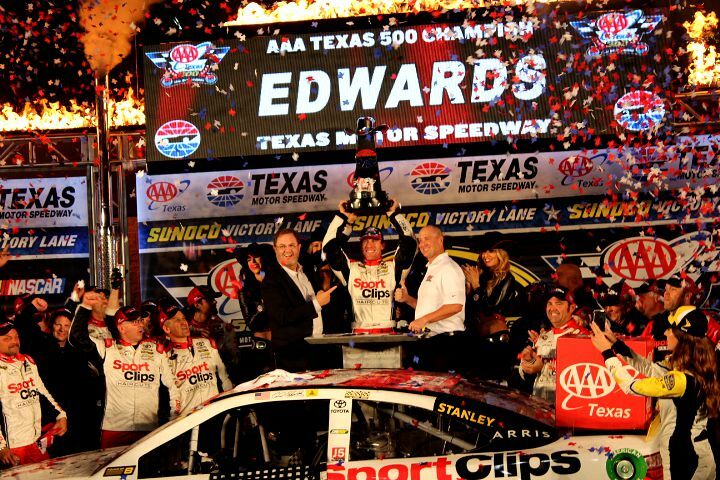 Carl Edwards secured his chance to compete for the championship with a win in the rain-shortened AAA Texas 500 Sunday night at Texas Motor Speedway. The race was scheduled for 334 laps, 501 miles but ended just shy of that mark with the red flag displayed at Lap 293. After confirming with pace car driver Brett Bodine that the track had indeed been lost, and that it would take a minimum of two hours to dry, NASCAR called the race. Rain began falling at the end of the national anthem, leading to a delay of almost exactly five hours from the scheduled 1:04 p.m. CST start time. After running a number of laps to help dry the track, the green and yellow flags flew, and five laps later the field took the green. However, with the specter of more rain looming, the teams stayed on edge through the night. Joey Logano led the most laps with 178, but the No. 19 pit crew put Edwards out front on Lap 253 with a pit stop that was under 11 seconds, and Logano just didn’t get enough laps to catch him. The driver of the No. 22 was philosophical about the situation, though. Third-place finisher Martin Truex Jr. needed another stop to contend for the win. Chase Elliott finished fourth despite having had flu-like symptoms during the day, with Justin Allgaier on standby. Kyle Busch managed a fifth-place showing despite having a hole punched in the nose of the No. 18 early in the evening. The race slowed eight times for caution, including the green-yellow start, for a total of 37 laps. One of those cautions was for the No. 27 of Paul Menard spinning in Turn 4. During his pit stop a tire exploded in front of the tire specialist, Mason Jennings, sending him to the infield care center. He was released a short time later. The final caution came out when Kevin Harvick got into Austin Dillon on Lap 263. Harvick claimed he had no malicious intent, but Dillon saw the situation differently and showed he has a racer’s memory. Heading into Phoenix for the final elimination before the championship race, the remaining six members of the Round of 8 must battle for the final two positions. See the final unofficial race results here.